The 1779 Sullivan Campaign emerged as one of the larger of the Continental Army’s offensives during the American Revolution, yet remains relatively unknown.1 It was an act of reprisal to break the Iroquois Confederation, a Native American political and military alliance that included the Seneca, Cayuga, Mohawk, Onondaga, 0neida, and Tuscarora tribes. The Iroquois, with the exception of the Oneida and Tuscarora, openly sided with Great Britain to protect their homelands. Together with Loyalists forces, they had ravaged the Pennsylvania and New York frontiers. The bloodiest of these attacks occurred in 1778 in the northeastern Pennsylvania’s Wyoming Valley and the Cherry Valley of New York. Through early 1779, General George Washington developed a strategic plan at his Middlebrook, New Jersey headquarters, for the coming campaign season. Although much of the military activity had shifted to the southern colonies, Washington’s army sat in a virtual stalemate with a British army entrenched within New York City. General Sullivan agreed with his commander’s goals, seeing his mission to convince the Iroquois “that we have it in our power to carry war into their country.” If his forces destroyed the Iroquois food supplies, it would force the British to support them through the following winter, creating an additional burden. When complete, Sullivan’s command would include four brigades, totaling about 4500 men. Specifically, he was given Enoch Poor’s Brigade consisting of three New Hampshire and one Massachusetts’s regiment, who Sullivan boasted “are all marksmen & accustomed to the Indian mode of fighting;”5 General William Maxwell’s New Jersey Brigade; Edward Hand’s Brigade of mostly Pennsylvania troops; and James Clinton’s Brigade of four New York regiments. In addition, Sullivan received a company of Virginia riflemen, and two independent artillery units. Pennsylvania also promised a sizable militia force. Washington had assumed that Sullivan would be on the march by early June and outlined the mission objectives for the “total destruction and devastation” of the Iroquois villages so “that the country may not merely be overrun but destroyed.” The villages would be burned, the crops destroyed, and as many prisoners as possible to be taken as hostages to guarantee any settlement. Washington warned Sullivan not to accept any offer of peace before “the total ruin of their of their settlements was effected.” He feared that the Iroquois would “amuse” them with insincere peace proposals to spare their homelands. “Our future security,” Washington wrote, would rest on the “Terror” inflicted upon them. He urged Sullivan to act aggressively and employ his men “in a loose and dispersed a way … It should be impressed upon the upon the minds of the men where ever they have the opportunity to rush on with the war whoop and fixed bayonet, ” to “discourage and terrify” their foes. In the meantime, Wyoming was bristling with over 2,000 Continentals. Supply boats arrived almost daily along with hundreds of pack horses and beef cattle for the expedition. Wyoming had been devastated the year before. The soldiers were amazed at the destruction of the town and the others around it. Some New Jersey troops visited the site of the “Wyoming Massacre,” where Colonel Zebulon Butler, a survivor, recounted the attack where over two hundred militia men had been killed.14 It was a brutal lesson in the harsh realities of frontier warfare. By late July, Washington had reached the limits of his patience for Sullivan’s reluctance to begin the campaign. He had envisioned a rapid strike into the Iroquois territory, not a slow methodical campaign. “I cannot but repeat my intreaties that you would hasten your operations with all possible dispatch,” he wrote. Washington urged Sullivan to consider that by its very nature, the expedition would have to travel light. Washington feared that if Sullivan carried too large a baggage train, his force would be over encumbered and risk being overwhelmed, or worse, be unable to travel deep into Indian territory. The army was well-guarded as it began its travel up the Susquehanna. At any one time the force would be stretched out for about six miles along the river. 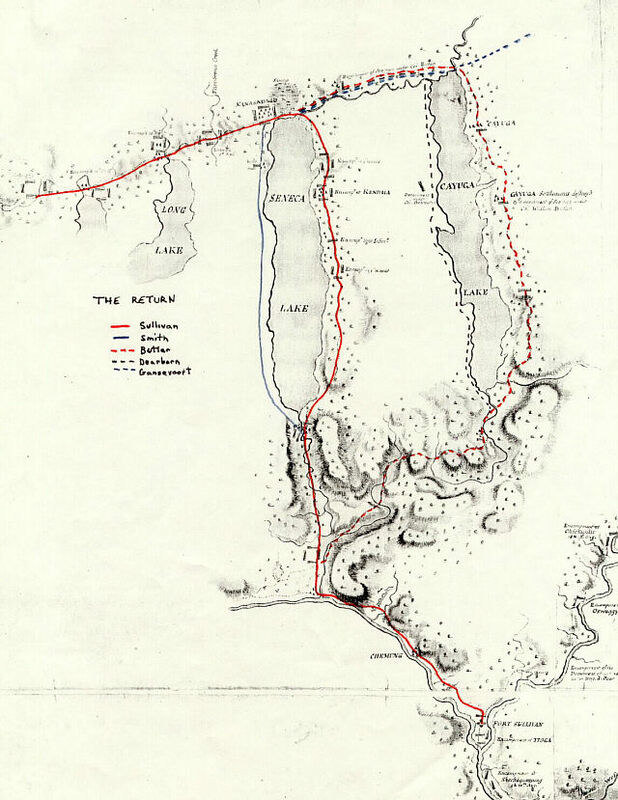 All along the march, the troops were anxious about being attacked, especially when the trail narrowed as it passed through an extremely mountainous stretch. The soldiers knew they were being watched. They expected an attack at any moment, and were surprised to pass unmolested despite “the many advantageous posts they might have occupied in annoying us.”21 The army reached Tioga on August 11. As his troops arrived, Sullivan took a more active approach. He sent a scouting party to the village of Chemung above Tioga. The scouts reported between two and three hundred Iroquois there, but “could not tell whether they mean to evacuate it or defend it.” The army marched through the night to surprise the town. The march overland through the darkness did not go smoothly. Units became lost and blundered through the forest.22They stormed the town, only to find it deserted. The soldiers looted and burned close to forty houses and burned the surrounding fields. The army finally left Tioga August 26, at least two months behind schedule. Hand’s light troops were out front, guided by a company of Virginia riflemen. Clinton took the rear and the other two brigades either flank, guarding the baggage train in a box like formation. Flanking parties were sent out. Their efficiency impressed even the British. John Butler wrote Fort Niagara informing them that they were “misinformed” about the composition of the force. It was not untrained militia, but “the best of the Continental Troops commanded by the most active of the Rebel Generals.”27 Significantly outnumbered, Butler planned to ambush Sullivan’s force and demoralize them before they got too deep into Iroquois territory. While the army feasted, the British and Iroquois made their move. Butler and Mohawk Chief Joseph Brant chose an ambush site near the village of Newtown along the line of march and gathered about seven hundred men, including Butler’s three hundred rangers. Below the actual town, the trail crossed a bend in a river and flanked by a two large hills. They constructed a breastwork across one ridge and camouflaged it with brush. It was hoped that a diversion would draw Sullivan across their front and the confusion generated from sudden firing from one flank, quickly followed by fire from the other would rout the army. Butler dug in and waited. On the morning of August 29, American riflemen approached the hidden entrenchments. Scouts had reported a large encampment the night before and the riflemen were wary. When a small group of Indians appeared ahead, the riflemen’s commander suspected an ambush and sent one of his men up a tree to scout out the ground ahead. Spying the enemy works, he alerted the rest of the army.30 Hand’s light troops rushed forward and joined the riflemen in skirmishing with the Indians, while they waited for the rest of the army. By 11:00 a.m., Sullivan arrived on the scene. 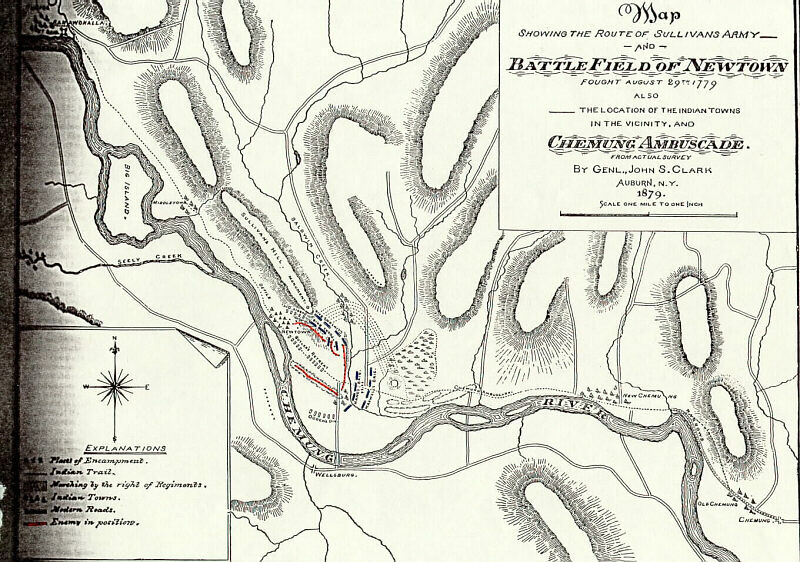 Sullivan ordered Poor’s and Clinton’s Brigades to outflank the Indian left and wide circle and come upon their rear. Hand would remain in front, and Maxwell’s Brigade would be in reserve. Sullivan kept his artillery out of sight, but would rush it forward to fire on the entrenchments once Poor and Clinton were in position. Butler still did not realize their trap had been discovered. The bombardment began at 3:00 p.m., but unfortunately Poor’s troops had blundered into a swamp and had not reached their position. Poor and Clinton heard the sound of the artillery and quickened their march. Although the barrage had routed part of the British force, the Continentals encountered stiff opposition on the back side of the hill. While the skirmishers exchanged shots, the regiments formed up for a bayonet charge. New Hampshire troops “advanced rappedly with fix’d bayonet without firing a shot altho they kept a steady fire on us,” Lieutenant Colonel Henry Dearborn wrote. A small expedition was sent to destroy another village a few miles up the river, while the riflemen and a company of light infantry pursued the fleeing Iroquois. Believing the Indians fled to Catherine’s Town, just to the north, Sullivan sought to catch them by surprise and ordered another night march August 31. The army quickly surrounded the town, but the town was empty. Canadasaga was the largest town yet, with over sixty houses and large peach and apple orchards.41 While his men destroyed the town, Sullivan dispatched several large parties to burn some outlying villages. Sullivan met with his officers to assess their situation. They were making great progress, averaging about ten miles a day. . Supplies were adequate, but there was some question as whether to continue, and if so, how far. The officers decided that their ultimate goal would be to destroy the Indians’ largest town, at Genesee Castle. That would guarantee them enough food to return to Tioga. To quicken their pace, the sick and wounded were sent back to Tioga. Boyd’s men traveled quickly, but became lost. They attacked a village above Genesee killing and scalping two Indians, before finally reaching Genesee. Boyd informed Sullivan that he would wait for the army, but apparently changed his mind and moved towards the main force. On September 13, Boyd’s men discovered an Indian ambush along the army’s path, surprising up to four hundred warriors. The fighting was brisk as Boyd’s men made a desperate stand in a grove of trees. Sullivan’s force heard the firing while waiting for a small bridge across a creek to be completed. With the sounds of battle, the light infantry forded the stream and drove the attackers away. Boyd’s command had been nearly completely wiped out, but had detected an ambush. Several bodies, including Boyd’s were missing.45 Boyd’s blundering may have saved the army from a costly ambush. They found Genesee deserted, but in the town’s center, they found the mutilated bodies of Boyd and one of his men. The detached columns arrived back safely, Dearborn arrived September 26, and Butler two days later. The entire army was once again on the move, reaching Wyoming on September 30, their mission completed. Casualties had been light and they had not been “detained by storms or any other Accident.”54 Several days of celebrating followed, as Washington’s orders for the reassignment of the Brigades arrived and the regiments headed off for duty elsewhere. Washington was pleased for the western army had completed its goals. Unaware of Sullivan’s progress, Washington had repeated the “the necessity of pushing the Indians to the greatest practible distance from their own settlements, and our own settlements, and our own frontiers,” to throw “them wholly on the British enemy.”57 By the time Washington penned these orders, the army had already completed its mission. Sullivan had met Washington’s objectives completely, accomplishing the effectual destruction of the Iroquois nations. The operation’s success resulted from a combination of careful planning and luck. The weather cooperated. Sullivan was aided by seasoned officers, who led a well-trained, disciplined army. They adapted their tactics to operating a large force in the wilderness. It was an unusual campaign, in that it was waging total war against an entire people, not just an enemy army. The major difficulties the army confronted resulted mainly from its own supply problems. Supplies had to be transported, and often times, many of the foodstuffs that arrived were spoiled, or ruined by improper packaging. The inability to gather the supplies quickly delayed the army for some time, allowing the British an possible opportunity to thwart the mission’s start. However, these delays also pushed the campaign into the harvest season, allowing to supplement its meager rations and stretch the campaign’s duration. The mere size and organization of this force made it extremely difficult for the ill-supplied and demoralized Loyalist and Iroquois to fight back. There were several points where Sullivan’s expedition could have been delayed, yet they passed virtually unmolested through Indian territory. Although the expedition devastated the Iroquois crops and towns and left them on the mercy of the British for the winter, one officer noted “The nests are destroyed, but the birds are still on the wing.”58 The Iroquois continued their devastating raids throughout the war, but the war broke the Iroquois Confederacy’s power. Following the war, much of the Iroquois lands would be absorbed by the United States. As for Sullivan, this was his most successful campaign and his last. Deteriorating health and a wish to be with his family, prompted his resignation. Congress, which had long put up with his chronic complaints, eagerly accepted it, ending Sullivan’s military career. This paper is based on a longer graduate research paper completed at Penn State. The author was unable to take advantage of a recent work, Joseph R. Fischer, A Well-Executed Failure: The Sullivan Campaign against the Iroquois, July-September 1779 (Columbia: University of South Carolina Press, 1997). Charles Whittenmore, A General of the Revolution: John Sullivan of NewHampshire (New York: Columbia University Press, 1961), 117-8. John Sullivan to George Washington, 15 April 1779, in Otis G. Hammond (ed. ), The Letters and Papers of Major General John Sullivan, Continental Army 3 vols. (Concord: New Hampshire Historical Society, 1939), 3:1-5. Hereafter JSP. John Sullivan to George Washington, 16 April 1779, ibid, 5-9. Lt. Col. Adam Hubley to Sullivan, 2 July 1779, JSP, 3:69-70; Sullivan to Joseph Reed, 11 May, 21 May 1779, ibid, 19, 28; Sullivan to Washington, 23 May 1779, ibid., 3:33-4. Washington to Sullivan, 28 May 1779, ibid., 3:44-5. Sullivan to Washington, 31 May 1779, ibid., 3:47. “Journal of Captain Daniel Livermore,” 10 June 1779, in Frederick Cook (ed. )Journals of the Military Expedition of Major General John Sullivan … (Freeport, NY: Books for Library Press, 1972 reprint of 1887 edition), 180. Hereafter Journals. Walter Butler to John Haldimand, 20 May 1779, in Alexander Flick (ed.) “New Sources on the Sullivan-Clinton Campaign, Quarterly Journal of the New York Historical Association 10(3) (1929), 218; Butler to Col. Mason Bolton, 18 June 1779, ibid., 265; Butler to Bolton, 3 July 1779, ibid., 266. “The Journal of James Norris,” 2 July 1779, Journals, 225. Board of War to Sullivan, 21 July 1779, JSP, 3:78-9. Sullivan to Jay, 21, 26 July 1779, ibid., 3:84,86. “Order Book of Lt. Col. Francis Barber, 3rd New Jersey, 8 July 1779, in Louise Murray, (ed.) Notes from the Craft Collection in the Tioga Point Museum … (Athens, PA: Tioga Point Museum, 1929), 28. Washington to Sullivan, 29 July 1779, ibid., 3:88. Order of March, 24 May 1779, ibid., 3:36-8. “The Journal of Rev. William Rogers, D.D.”, 5 Aug. 1779, Journals, 256-60. Sullivan to Jay, 15 Aug. 1779, JSP, 3:95; Almion Lauder (ed. ), Orderly Books of the Fourth New York Regiment, 1778-1780 … (Albany: State University, 1932), 78; “The Journal of Lt. William Barton”, 12 Aug 1779, Journals, 6. “The Journal of Major Jeremiah Fogg,” 13 Aug. 1779, ibid., 92; Sullivan to Jay, 15 Aug. 1779, JSP 3:95-8. Sullivan to James Clinton, 6 Aug. 1779, ibid., 90. Fogg, 15 Aug. 1779, Journals, 92. Sullivan to Colonel William Shreve, 24 Aug. 1779, JSP 3:101-3; Fogg, 24 Aug. 1779, Journals, 92. John Butler to Mason Bolton, 26 Aug. 1779, in Flick, 281. “The Journal of Sgt. Moses Fellows,” 27 Aug. 1779, Journals, 87. Fogg, 27 August 1779, ibid., 94. Hubley, 29 Aug. 1779, ibid., 155; The generalities of the battle appear in Sullivan’s report, 30 Aug. 1779, JSP 3:107-112. For a British perspective, see John Butler to Mason Bolton, 30 Aug. 1779, in Flick. “The Journal of Lt. Col. Henry Dearborn,” 29 Aug. 1779, Journals, 72. “The Journal of Lt. Erkuries Beatty,” 30 Aug. 1779, Journals, 27; Fogg, 30 Aug. 1779, ibid., 95.33 Sullivan to Washington, 30 Aug. 1779, JSP 3:113. Sullivan’s Address to Soldiers, 30 Aug. 1779, ibid., 113. Barton, 1 Sept. 1779, Journals, 8-9. Fogg, 1 Sept. 1779, ibid., 89. John Sullivan to the Oneida Indians, 1 Sept. 1779, JSP 3:114. Beatty, 3 Sept. 1779, Journals, 28. Dearborn, 5 Sept. 1779, ibid., 74; Barton, 5 Sept. 1779, ibid., 11. Fogg, 7 Sept. 1779, ibid, 97. ” The Journal of Major John Burrowes,” 9-10 Sept. 1779, ibid., 45-7. Beatty, 11 Sept. 1779, Journals, 31. Sullivan to John Jay, 30 Sept. 1779, JSP 3:129-30. Dearborn, 14 Sept. 1779, Journals, 75. Sullivan to Jay, 30 Sept. 1779, JSP 3:130-31. “The Journal of Sgt. Major George Grant,” 15 Sept. 1779, Journals, 112. Fellows, 15 Sept. 1779, ibid, 91. Sullivan to Jay, 30 Sept. 1779, JSP 3:132. Barton, 17 Sept. 1779, Journals, 12. Sullivan to Oneida Indians, 18 Sept. 1779, JSP 3:118. Beatty, 24 Sept. 1779, Journals, 33. “The Journal of Lt. William McKendry, 30 Sept. 1779, ibid., 209. Sullivan to Jay, 30 Sept. 1779, JSP 3:134. Daniel Broadhead to Sullivan, 10 Oct. 1779, ibid, 148. Washington to Sullivan, 15 Sept. 1779, ibid., 121. Fogg, 30 Sept. 1779, Journals, 101. Copyright © 2019 Chemung Valley. All rights reserved.